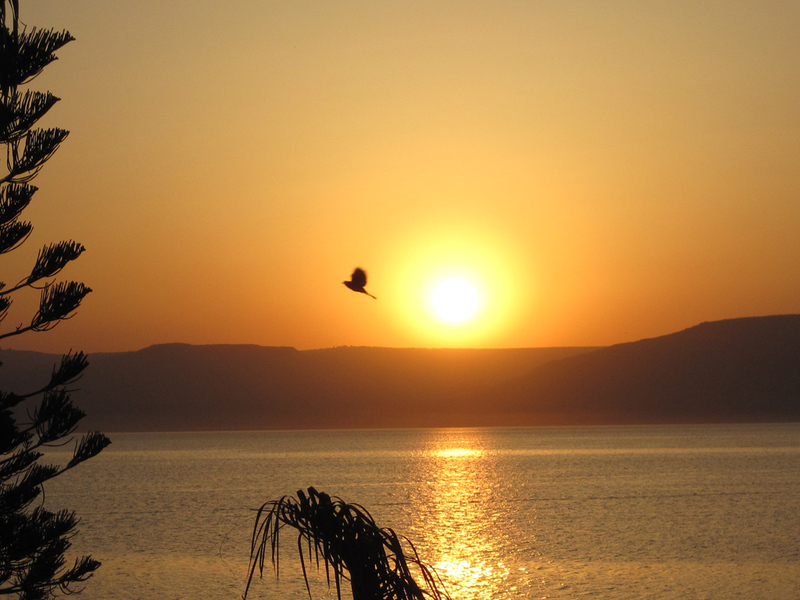 Sunrise on the Sea of Galilee. Photo by Ferrell Jenkins. 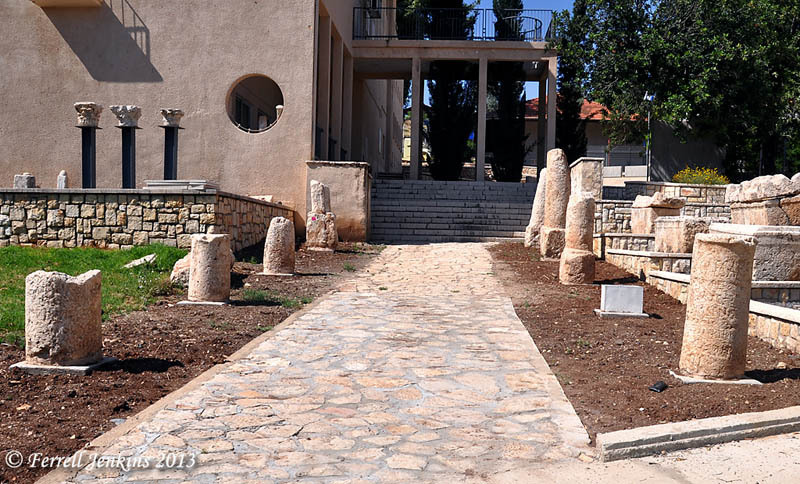 Beit Sturman Museum is one of the biggest archaeological museums of the country. Rich collection of flora and fauna of the region. History of Jewish settlements in Israel valley. The museum is named in honour of one of the founders of kibbutz – Haim Sturman. 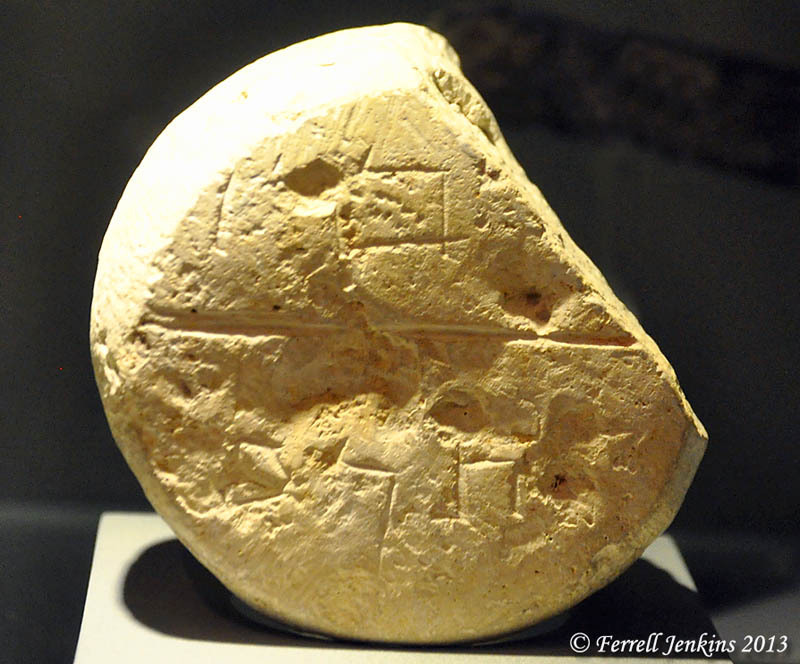 What really caught my attention was when I read that the Museum had a large collection of Roman milestones that were found in the Jezreel Valley. Only seven milestones are visible in the photo below but there are dozens of others in the courtyard of the Museum. Many of them are broken, and very few of them have any visible inscription. I thought I recognized TR on one of them. I think this would indicate a milestone erected during the reign of the Emperor Trajan in the early 2nd century A.D.
A few of the Roman Milestones displayed at the Beit Sturman Museum, En Harod, Israel. Photo by Ferrell Jenkins. 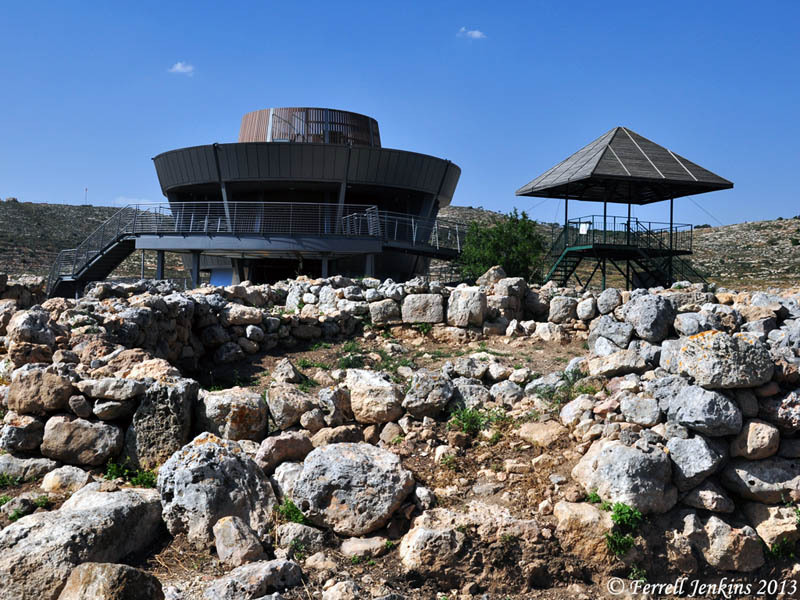 The museum has a display of flora and fauna of the Jezreel Valley, several cases of pottery from sites in the area, and a display of agricultural practices including the first bale of cotton grown in Israel. That brought back a lot of childhood memories of when I picked cotton and went to the gin with my father or grandfather in North Alabama. We also visited Tell Shalim, thought to be the site of Salim in the duo Aenon near to Salim, where John the Baptist baptized after Bethany Beyond the Jordan (John 3:23; 1:28). This is a place that would be impossible for a tour bus to go. 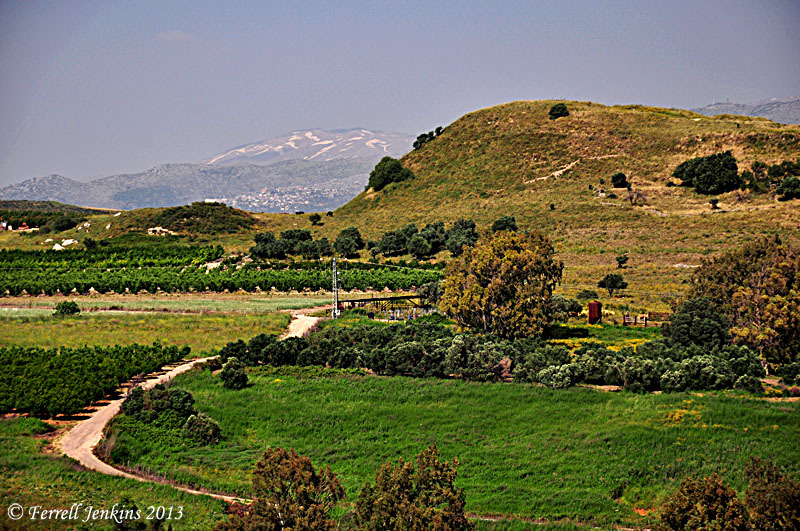 It is about 8 miles south of Beth-shan, near the Jordan River. There were a few other stops. We were disappointed when we were unable to get to the Roman Road at Golani Junction. A new road has been built east from the McDonald’s with a metal rail and a ditch that I didn’t think I would want to try to cross. Some individual travelers will be disappointed in this change. We have had two busy days. Yesterday we made arrangements to visit the so-called Solomon’s Pools south of Jerusalem, and a few other places in the Bethlehem area. The last time I was at the site was probably in the 70s. This is the sort of place that it would not be advisable to take a large tour group in a bus. Later I plan to show you some of the photos that I made and explain about the sites. 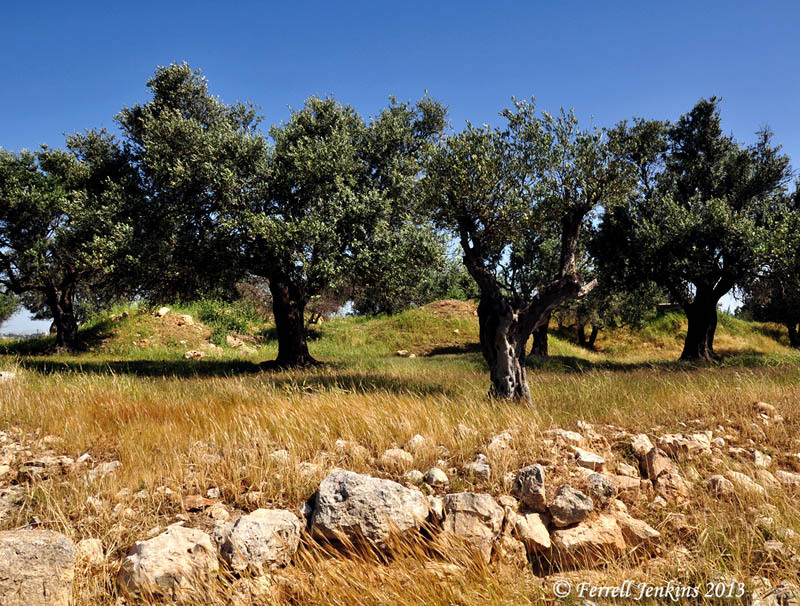 In the late afternoon we went down into the Shephelah to visit Khirbet Qeiyafa, the fortress overlooking the Elah Valley. I did not see many changes since my last visit in 2012. This morning we visited the Israel Museum. I was just there last week, but enjoyed the time making some additional photos that I had overlooked before. Dan also visited the Herod the Great exhibit. In the afternoon we drove north to Shiloh, the place where the tabernacle rested after the children of Israel entered the promised land (Joshua 18). A new viewing tower has been built, but is not yet ready for visitors. A young lady at the ticket booth/shop said they hope to have it open this month. The old and new viewing towers at Shiloh. Photo by Ferrell Jenkins. I thought the 27 NIS (about $8) was high for the condition of the site. A few of the older signs are visible, but no new ones. A small brochure was the only help the visitor has. Maybe this will improve with time. We also visited Taybeh, a possible candidate for the site of Ephraim. This is the place to which Jesus retired prior to his crucifixion (John 11:54). From Taybeh on the edge of the wilderness we continued to the Jordan Valley, then back up to Jerusalem. The weather. Those who were with me last Sunday in Jerusalem, when it was chilly and rainy, will find it difficult to believe that it was 99 degrees here today with bright sunshine. Last week I had the heat on in the room. Tonight I have on the air. 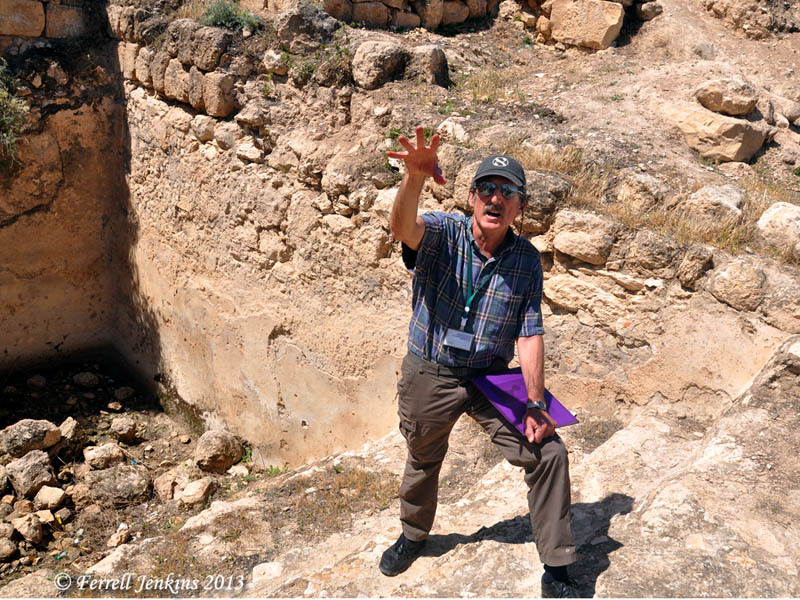 Today was the final day of the 2013 Bible Land tour of Israel. We had some great visits today, but it has been a long day and I am about ready to turn in for the day. Our group should be boarding their flight to the USA. My friend, Dan, arrived on time, but without his luggage. It went to LAX instead of TLV! Not an easy mistake to make. We will be spending about a week or more traveling about the country. Late this afternoon our group had dinner at a seaside restaurant in Joppa. 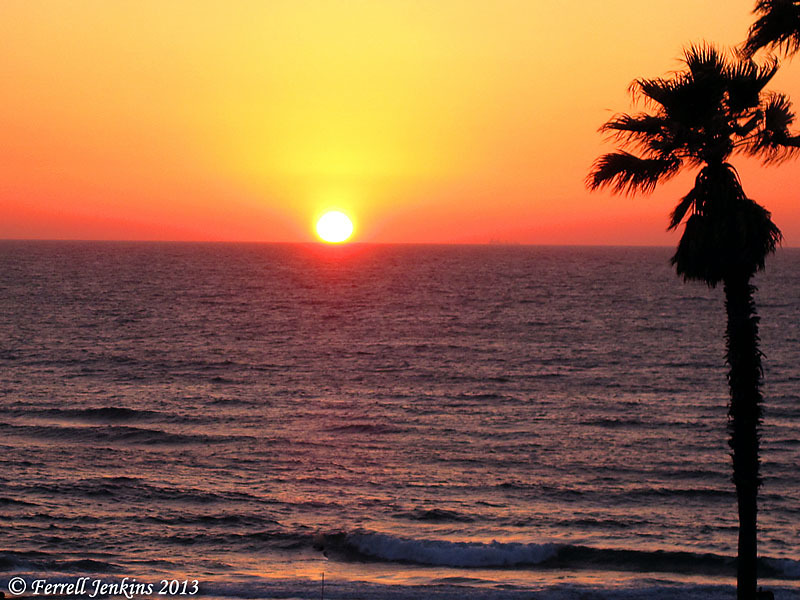 I decided to share the beautiful sunset we saw about the time we finished eating. Sunset on the Mediterranean from Joppa. Photo by Ferrell Jenkins. A nice conclusion to a wonderful, sunny day. Our tour group visited several places in and near Jerusalem today. We began Jaffa Gate and the Tower of David (actually built by Herod the Great). We moved on through the Jewish Quarter to the Wohl Archaeological Museum. For general information about the Jewish Quarter see the informative web site dedicated to the area, here. Information about the Museum, where you may see the ruins of six houses built on the slope between the Upper City of Jerusalem and the Temple Mount, is available here. These houses indicate that some of the wealthiest residents of Jerusalem lived in them – perhaps the priestly class. These houses were destroyed in the Roman destruction of Jerusalem in A.D. 70. Photos are not allowed in the Museum. Then we went to the Burnt House – a house belonging to the Katros Family, a priestly family that made incense for the temple. This house also burned when Jerusalem was destroyed. The photo below shows the basement area of the house. An informative video describing what life might have been like in the months leading up to the destruction is shown. 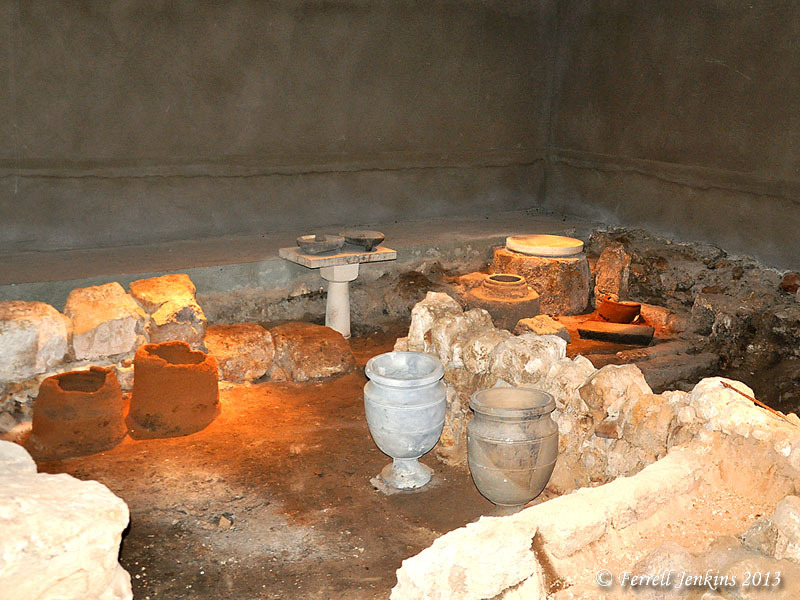 Basement of the Burnt House destroyed by the Romans in A.D. 70. Photo by Ferrell Jenkins. The furnishings here also indicate wealth. Notice the stone jars and table. The area on the right side shows evidence that the house was burned. Inscription mentioning the Katros family. Photo by Ferrell Jenkins. The Katros family is mentioned in the Talmud as a priestly family that abused their position. After visiting the Western Wall and the excavations south of the Temple Mount, we went to the Ramat Rachel Hotel for lunch. We only had time to drive by the Herodion before making our way to the Garden Tomb for our appointment.